Coins were first used in the Iron Age kingdom of Lydia well over two thousand years ago. Although it is not documented, you can rest assured that the world’s first coin collectors started at about the same time. Over the years coin collecting has been called the “Hobby of Kings” because only kings could afford to collect rare coins. It has now morphed into “The King of Hobbies” because everyone can now afford to collect coins. Coin collecting is a hobby that can last a lifetime because there are always new coins to collect. Additionally, there are as many ways to collect coins as there are coin collectors. The possibilities are endless. Coin collecting reached its peak in the United States in the 1950s and '60s. There was a coin shop on almost every corner. The coin collecting market bottomed out in the 1980s and 1990s due to economic downturns and the advent of high-tech devices and video games that could occupy our time. Today, there are a wide variety of ways to obtain and collect coins. Experts estimate that over 140 million people collected the 50 State Quarters®. It is a little-known fact that even celebrities collect coins. Actors Buddy Ebsen, James Earl Jones, Nicole Kidman, and Penny Marshall are a few Hollywood coin collectors. Even sports stars such as Wayne Gretzky, Dennis Rodman, and Kareem Abdul-Jabbar ventured into coin collecting, too. Here are six reasons why you should start a coin collection today! Coin collections can also function as an investment instrument to diversify your portfolio. Rare gold and silver coins can be purchased from a reputable coin dealer to add value to your range of investments. Many experts will tell you that precious metal bullion coins can reduce the amount of risk in your investment strategy. Additionally, you can easily liquidate your coin collection if you need cash. It Is human nature that we like to see things through to completion. It gives us a sense of satisfaction when we can see a task completed or goal accomplished. Successful coin collectors begin by establishing a goal of what they want to collect. Sometimes it is the “thrill of the hunt” that gives us satisfaction when we find the perfect coin for our collections. Satisfaction also can be obtained by finding a valuable coin in your pocket change. Finally, the pride of ownership of the valuable coin collection is one of the most satisfying benefits of collecting coins. The design of each coin begins in the skillful hands of an artist. Although many different types of artists can design coins, the best artists are the ones that understand bas relief sculptures. Most numismatists agree that the most beautiful United States coin ever made was the Saint-Gaudens double eagle, minted between 1907 and 1933. Other masterpieces include Victor David Brenner’s Lincoln cent, Bella Lyon Pratt’s Indian Head quarter eagle and half eagle sculpted in sunken relief, and William Wyon’s The Una and the Lion on a British £5 gold coin. In effect, coin collections are actually collections of art. The owner of a carefully assembled coin collection will want to display their cherished works of art proudly. Almost all coins feature some historical element. It can feature the victory of an ancient war immortalized on an ancient Roman coin, the inauguration of a king or queen on a medieval coin, or a circulating commemorative coin showcasing each of the fifty United States and six territories and protectorates. Colonial coins minted in the United States before the formal founding of the United States Mint in 1792 are actual pieces of history you can hold in your hands. The same can be said for pirate treasure coins and coins recovered from shipwrecks from the century gone by. World coins can introduce you to other countries and cultures from around the world. A carefully planned and investment-driven coin collection can turn out to be a valuable inheritance for your heirs. Although very few people get rich overnight from collecting coins, carefully planned and thought out investment strategies in rare and valuable coins can appreciate over time. Take the time to get your children or grandchildren interested in coin collecting. 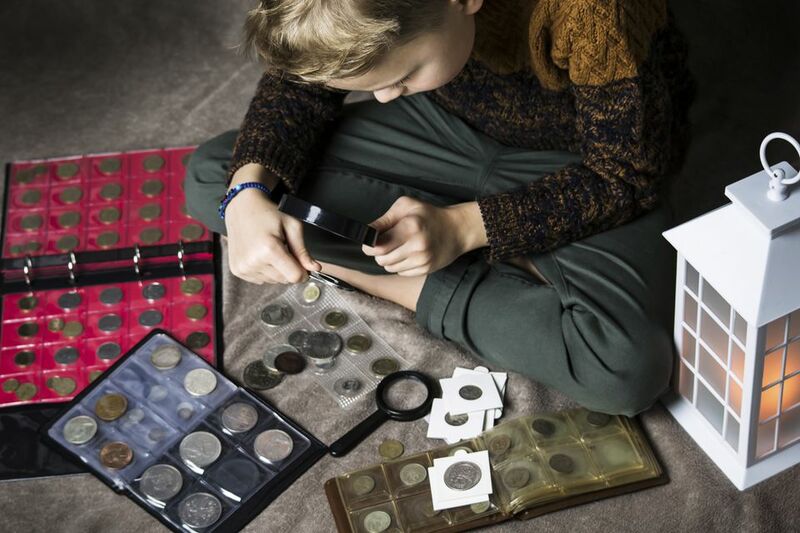 Most children will lose interest in coin collecting during their teenage years but may return to it years later. Years from now, they can look back on your legacy captured in your coin collection. They may even remember acquiring a special coin from you. Assembling a coin collection and studying the origins of a particular coin can take your mind off the stress and pressures that you experience throughout the day. Coins are easy to collect and can be collected right from your pocket change, at a favorite coin store, coin show, or through the Internet. There are also coin clubs around the country that can add social interaction to your coin collecting hobby. Getting started is easy for a collector on any budget.